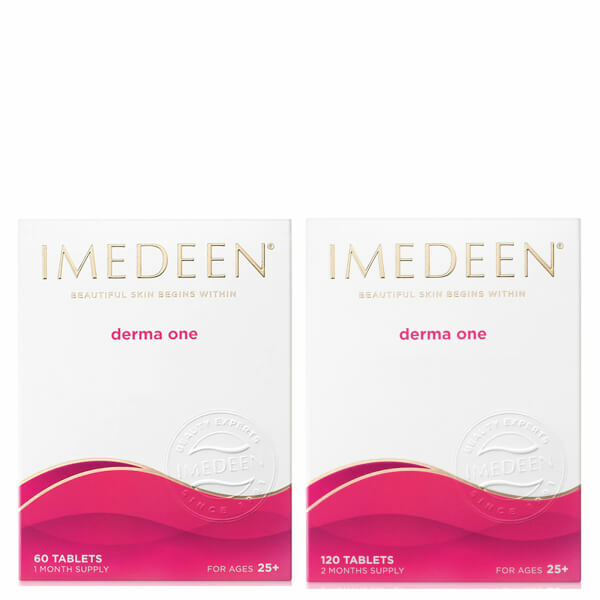 The Imedeen DermaOne 3 Month Supply Bundle combines a total of 180 Derma One tablets to help tackle signs of ageing. The food supplements help to maintain skin's health while controlling the production of collagen for younger-looking skin. Helps to prevent signs of ageing that everybody worries about. Boasting a Marine Complex™, which is enhanced with Zinc and Vitamin C, the capsules are rich in proteins and polysaccharides often found in the skin's natural supportive structure. The vitamin-enhanced formula is ideal for maintaining your skin´s health as well as controlling the production of collagen. Lycopene and Grape Seed extract work together to protect the collagen and elastin proteins. You will see noticeable results after 3 months of use. Prepare yourself for a softer-looking, radiant complexion. The recommended daily dose for adults above the age of 30 is 2 tablets, taken with food. Do not exceed the daily dosage. Store at room temperature. Keep out of reach and sight of children. Each pack contains 2 months' supply of tablets. Bulking Agent: E 460, Fish Extract, Starch, Sodium-L-Ascorbate, Zinc Gluconate, Anti-caking Agents: E 551, E 470b. Allergy Advice - For allergens, see ingredients in bold.